Gorkha Janmukti Morcha president Bimal Gurung made it clear on Thursday that he was not concerned with the opposition of West Bengal state BJP to the Gorkhaland demand and would pin his hopes on BJP leaders in Delhi to secure a separate state for Gorkhas. He lauded senior BJP leader Subramaniam Swamy for taking up the Gorkhaland demand with the Centre. According to Gurung, the former cabinet minister in his Twitter handle @Swamy39, has evoked the sentimental issue of the Gorkha community of the Darjeeling hills and said, “I have written to Rajnath on steps to the formation of a Gorkha Pradesh”. The GJM chief said so during a function organised by the Bharatiya Gorkha Janjati Sangarsh Mahasangh (BGJSM), a conglomeration of 10 communities of the hills demanding inclusion in the Scheduled Tribe list. Talking to reporters afterwards, Gurung said he had spoken to Swamy over phone and expressed gratitude on behalf of all the people of the hills. “I just spoke to him (Swamy) in Delhi and thanked him for helping us to strengthen our demand further. The fact that Mr Swamy wrote to Union Home Minister Rajnath Singh on the statehood issue shows the significance he has placed on the formation of a separate state for the Indian Gorkhas. 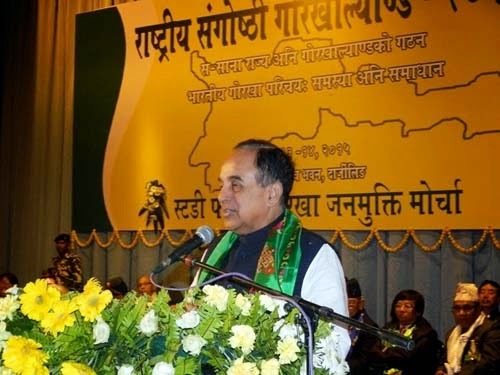 Mr Swamy told me his letter to the union home minister outlines the various steps that could be taken towards the creation of a Gorkha Pradesh,” the GJM president said. repaired on emergency footing. Also written to railway minister Suresh Prabha that the Darjeeling toy train be technologically upgraded with UNESCO help. Will promote tourism too.” These were some of the topics Swamy taken up at the national seminar and promised to pursue with the Centre. Gurung said he would leave for Delhi on May 15 to thank Swamy in person and also meet other central BJP leaders to pursue the statehood demand. “It (statehood) will not happen overnight. But we will continue to do what is required to get closer to our aspiration. I will be in Delhi on May 15 or 16 and will take up the statehood issue and also the inclusion of 11 communities including one from the Dooars in the Schedule Tribe category,” he said.